YOUNGSTOWN, OH.- Pierre Soulages (born 1919), an internationally renowned artist of French origin, has a worldwide following. Recently, the Pompidou Centre in Paris hosted a retrospective of work by Frances famed “painter of black,” drawing from collections around the globe to honor Soulages, a French cultural icon. 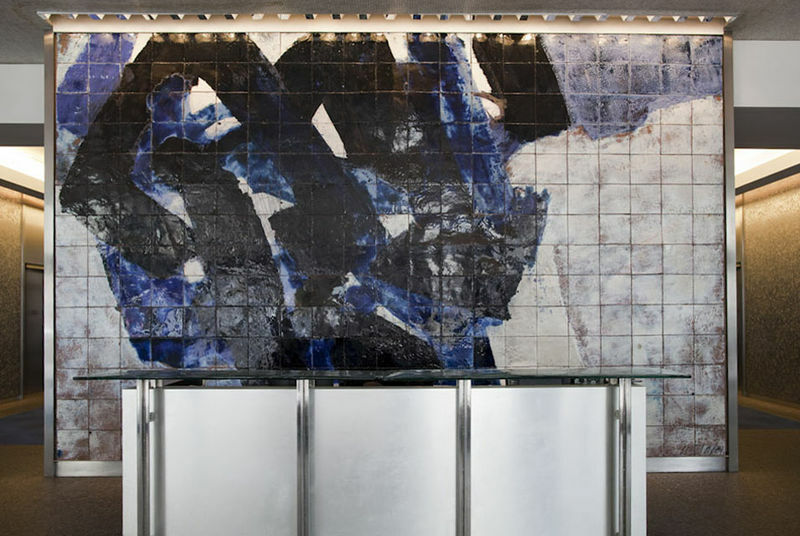 In 1968, Pierre Soulages created a site-specific tile mural commissioned by the owners of One Oliver Plaza, a building in Pittsburgh. In the spring of 2009, the Oliver building was sold and the new owners planned to remove the 14 x 20 foot mural, composed of 294 individual, hand-formed ceramic tiles. This masterwork, unveiled in Pittsburgh in May of 1968, was offered to art museums and organizations there; none were willing to undertake the difficult removal of the work. The Director and Board of the Butler Institute accepted the work as a gift from the new owners of the Oliver building, and removed the delicate tile mural in an intensive ten-day time period in July, 2009. The monumental project was accomplished through the dedicated work of Michigan tile restoration expert, Larry Mobley, directed by retired engineer and Butler Board of Trustees President, Vincent Bacon. Construction of the “Soulages Gallery” is nearly complete. Initial contributions to support this project include; a grant from the WarrenArea Chamber Education, Civic and Cultural Foundation (Youngstown-Warren Regional Chamber), a gift from the family of Ray Travaglini,Foundation Medici and a grant from the Trumbull County Convention & Visitors Bureau. Additional funds are being sought to assist with this effort. 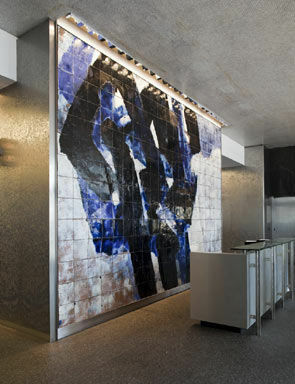 Pierre Soulages' site-specific tile mural commissioned by the owners of One Oliver Plaza. PETOCHI, ROME. 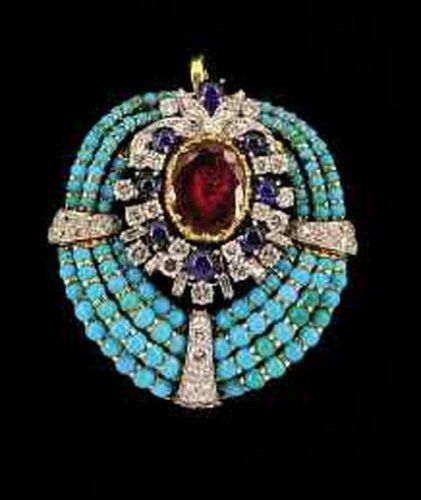 PENDENTIF BAROQUE. VERS 1970.